2015-05-19. New. Ships with Tracking Number! INTERNATIONAL WORLDWIDE Shipping available. Buy with confidence, excellent customer service! 2015-05-19. Good. Ships with Tracking Number! INTERNATIONAL WORLDWIDE Shipping available. May not contain Access Codes or Supplements. May be ex-library. Shipping & Handling by region. Buy with confidence, excellent customer service! 2015-06-08. New. Ships with Tracking Number! INTERNATIONAL WORLDWIDE Shipping available. Buy with confidence, excellent customer service! McGraw-Hill Education. PAPERBACK. 0071381392 New Condition. . New. McGraw-Hill Education. PAPERBACK. 0071381392 Like New Condition. . Fine. McGraw-Hill Education. PAPERBACK. 0071381392 Expedited shipping NOT available. Brand New. Exceptional customer service. Standard shipping is ground. All deliveries in 4-14 business days. . New. Tantor Audio. MP3 CD. 1494562294 Special order direct from the distributor . New. Tantor Audio. MP3 CD. 1494562294 *BRAND NEW* Ships Same Day or Next! . New. Tantor Audio. MP3 CD. 1494562294 *LIKE NEW* Ships Same Day or Next! . Fine. McGraw-Hill Education. PAPERBACK. 0071381392 Brand New ,Original Book , Direct from Source , Express 5-8 Business days worldwide Delivery. . New. McGraw-Hill Education. PAPERBACK. 0071381392 Special order direct from the distributor . New. McGraw-Hill Education. PAPERBACK. 0071381392 . New. McGraw-Hill Education. PAPERBACK. 0071381392 Remainder mark . Fine. McGraw-Hill Education. PAPERBACK. 0071381392 BRAND NEW, GIFT QUALITY! NOT OVERSTOCKS OR MARKED UP REMAINDERS! DIRECT FROM THE PUBLISHER!|0.68 . New. U.S.A.: McGraw-Hill, 2002. 254 pp. Copy appears unread.. Paperback. Fine. Mc Graw Hill, 2002. Trade Paperback. Good. Chicago: Contemporary/McGraw Hill, 2002. Very Good +/Near Fine DJ. 12mo = 7-9". Trade Paperback. Some light overall soiling to covers; price sticker on back. Great binding, clean pages. "Gentle ways to Help Your Baby Sleep Through the Night." Sleep solutions for those opposed to the cry-it-out method, by parent educator Elizabeth Pantley. McGraw Hill, 2002. Softcover. NF.. By the author of Gentle Baby Care. McGraw-Hill Contemporary Book. Used - Good. Paperback. Text body is clean, and free from previous owner annotation, underlining and highlighting. Binding is tight, covers and spine fully intact. Cover shows general mild surface and edge wear. Page edges largely clean with some slight marking..
New York, N.Y.: McGraw-Hill, 2002. Very good, paperback, front cover creased.. Trade Paper. Very Good. Prakash Books, 2004. Softcover. New. A breakthrough approach for a good night`s sleep--with no tears There are two schools of thought for encouraging babies to sleep through the night: the hotly debated Ferber technique of letting the baby "cry it out," or the grin-and-bear-it solution of getting up from dusk to dawn as often as necessary. If you don`t believe in letting your baby cry it out, but desperately want to sleep, there is now a third option, presented in Elizabeth Pantley`s sanity-saving book The No-Cry Sleep Solution. Pantley`s successful solution has been tested and proven effective by scores of mothers and their babies from across the United States, Canada, and Europe. Based on her research, Pantley`s guide provides you with effective strategies to overcoming nap time and nighttime problems. The No-Cry Sleep Solution offers clearly explained, step-by-step ideas that steer your little ones toward a good night`s sleep--all with no crying. Tips from The No-Cry Sleep Solution: Uncover the stumbling blocks that prevent baby from sleeping through the night Determine--and work with--baby`s biological sleep rhythms Create a customized, step-by-step plan to get baby to sleep through the night Use the Persistent Gentle Removal System to teach baby to fall asleep without breast-feeding, bottlefeeding, or using a pacifier Printed Pages: 272. Prakash Books, 2004. Softcover. New. A breakthrough approach for a good night`s sleep--with no tears There are two schools of thought for encouraging babies to sleep through the night: the hotly debated Ferber technique of letting the baby ""cry it out,"" or the grin-and-bear-it solution of getting up from dusk to dawn as often as necessary. 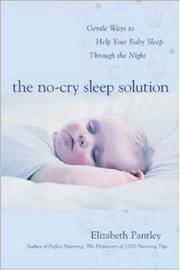 If you don`t believe in letting your baby cry it out, but desperately want to sleep, there is now a third option, presented in Elizabeth Pantley`s sanity-saving book The No-Cry Sleep Solution. Pantley`s successful solution has been tested and proven effective by scores of mothers and their babies from across the United States, Canada, and Europe. Based on her research, Pantley`s guide provides you with effective strategies to overcoming nap time and nighttime problems. The No-Cry Sleep Solution offers clearly explained, step-by-step ideas that steer your little ones toward a good night`s sleep--all with no crying. Tips from The No-Cry Sleep Solution: Uncover the stumbling blocks that prevent baby from sleeping through the night Determine--and work with--baby`s biological sleep rhythms Create a customized, step-by-step plan to get baby to sleep through the night Use the Persistent Gentle Removal System to teach baby to fall asleep without breast-feeding, bottlefeeding, or using a pacifier Printed Pages: 272. McGraw-Hill Education, April 2002. Trade Paperback. Used - Good. McGraw-Hill Education. PAPERBACK. 0071381392 Book is not new, but in very good condition. No writing or markings on pages. Cover is very good with minor - moderate wear. Buy with confidence...customer service is our TOP PRIORITY! Quick Shipping/ Free Delivery Confirmation! . Very Good. McGraw-Hill, May 2002. Paper Back . Very Good. Very Good Softcover. Light soiling and shelfwear to covers. Pages clean and tight in binding. Pictures available upon request. A locally owned, independent book shop since 1984. McGraw-Hill Education, 2002-04-18. Paperback. Used-Good. Ships within 24 hours!Softcover. Tight binding, clean text, minor shelf wear. Creases on the cover. Tiny stains on the top edges of the pages. McGraw-Hill Education. Paperback. 0071381392 . Fair. 2002. McGraw-Hill Education. PAPERBACK. 0071381392 NEW HAWAII AND ALASKA CUSTOMERS PLEASE USE PRIORITY SHIPPING SHIPS 2 BUS DAYS . New. McGraw-Hill Education. PAPERBACK. 0071381392 Ships promptly from Texas. . New. 2002. McGraw-Hill Education. PAPERBACK. 0071381392 Ships from Tennessee, usually the same or next day. . New. 2002. Trade Paperback. Contemporary Books 2002. Unless Listed in this decription, VG or Better. McGraw-Hill Education. PAPERBACK. 0071381392 Outstanding Condition! All pages/text and binding are excellent, clean, tight. Shows very minor use. One dog eared page. Buy with confidence ....Customer Service is our TOP PRIORITY ! Delivery confirmation on all orders. . Fine. McGraw-Hill Education. Used - Like New. Like New condition. McGraw-Hill Education. Used - Very Good. Very Good condition. McGraw-Hill, May 2002. Paper Back. Good. Contemporary Books, Inc., 2002 Light shelfwear. ***We ship daily. Our books are carefully described and packaged in boxes (not envelopes). A gift card and personalized message can be included upon request.***. Paperback. Fine. 8vo - over 7¾" - 9¾" Tall. McGraw-Hill, May 2002. Trade Paperback Trade Paperback. Good. Pantley,Elizabeth No-Cry Sleep Solution: Gentle Ways To Help Your Baby Sleep Through The Night Edge and corner wear. Creases to cover. Pages still clean and tight. All orders shipped with tracking number and e-mail confirmation. All Orders Shipped With Tracking And Delivery Confirmation Numbers. McGraw-Hill Contemporary, 04/01/2002. Paperback. Used; Good. **WE SHIP WITHIN 24 HRS FROM LONDON, UK, 98% OF OUR ORDERS ARE RECEIVED WITHIN 7-10 DAYS. We believe you will be completely satisfied with our quick and reliable service. All orders are dispatched as swiftly as possible! Buy with confidence!